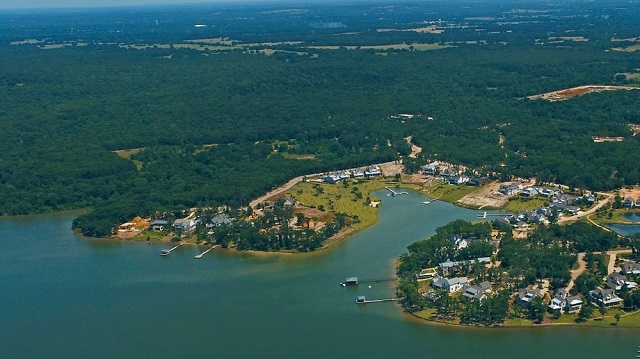 Whether you’re looking to build your dream family legacy home or you’re ready to escape to lake living right now, the popular Long Cove luxury community at Cedar Creek Lake has several options that’ll fit you. If you’ve ever tried to purchase land to build your dream home from the ground up, you’ll know it’s not as easy as it sounds. Finding available land that’s truly buildable is a challenge. Luckily, Long Cove has a few last lakefront sites in the established Dodd’s Point neighborhood that can be combined to create an acre-plus of waterfront property ready for construction. The lakefront home site, available for $1.75 million, measures 0.775 acres with 227 feet of waterfront land. The adjacent lot is available and can be combined to add a half-acre. Back in March we told you about Long Cove’s newest luxury lakefront neighborhood, Henderson Bay, and now we’ve got complete details about the sleek new townhomes being built there by Robert Elliott Custom Homes, starting from $695,000. Since the beginning, we’ve followed Don McNamara’s Long Cove development as it’s become a sprawling 1,000-acre second-home haven and a go-to weekend spot for many in the Metroplex. Long Cove, located on the clear, deep end of Cedar Creek Reservoir, was inspired by getaways like those of the Seaside and Watercolor communities in Florida. But this new 40-acre private and protected cove will feature sandy beach volleyball, a slide into the lake, lakeside fire pits, shared play fields, and rolling lawns. Plus there’s an amphitheater large enough to host an orchestra for outdoor concerts. Trend alert: now more than ever, high-end developments are offering exclusive getaways and glamping retreats to qualified luxury home buyers. If you’re in the market for a vacation home or place to retire, there’s no better way to experience the lifestyle than with try before you buy. Not sure where to start? No problem! We’ve done all the work for you in our list of top “try before you buy” vacation spots. Pick a place that speaks to you and indulge in a brief (and sometimes free) house hunting expedition for the second home of your dreams. Disclaimer: You’ll want to pack your bags immediately. Our Splurge: 13290 Waterside Drive Malakoff, TX is currently listed by Michelle Wood with Compass Real Estate for $1,595,000. What better way to enjoy summer in Texas than at the lake? This week we take you to Cedar Creek Lake where we zero-in on two exceptional lake homes, each with fabulous amenities and waterfront views, but with price points that are miles apart. Whether you’re looking for a Texas lake home with all the bells and whistles, or a rustic charmer right on the water, our latest Splurge vs. Steal has you covered. Get First Dibs on Long Cove’s New Henderson Bay Home Sites! Long Cove is hosting a Lake Home Sales Event for Henderson Bay, pictured here, this Saturday, March 31st on Cedar Creek Lake. It all started with a big idea – to create a luxury lake front community close to Dallas with all the comforts of home, but without all the maintenance. A place where you can unplug, unwind, and enjoy time with your family and friends. That place is Long Cove, the brainchild of Dallas’ own Don McNamara, developer and investor behind Cityplace and West Village in Uptown. Inspired by getaways like those of Seaside, Watercolor, and Horseshoe Bay, the folks at Long Cove bring those memorable experiences closer to home, spanning more than 1,000 acres, and boasting six miles of shoreline at the clear, deep end of Cedar Creek Reservoir – and it just keeps getting better with newly developed Henderson Bay. 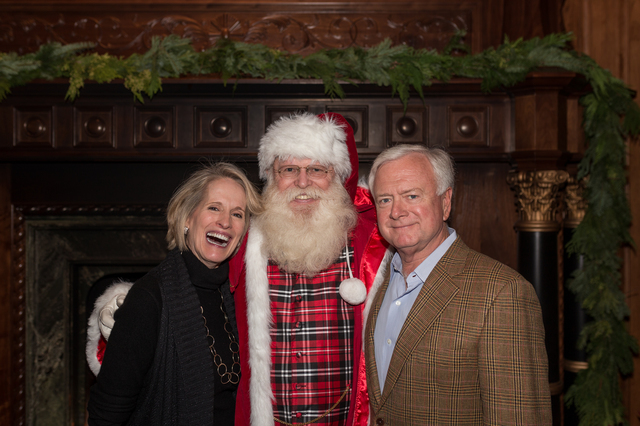 Joanie McNamara and Long Cove Founder Don McNamara with one jolly old elf at the Long Cove Holiday Bash. Who doesn’t love a great Christmas party? And better yet, who doesn’t love a good Christmas party where you don’t have to do any of the work? If it sounds too good to be true, you must not be a resident of Long Cove, one of the best second home communities in Texas. 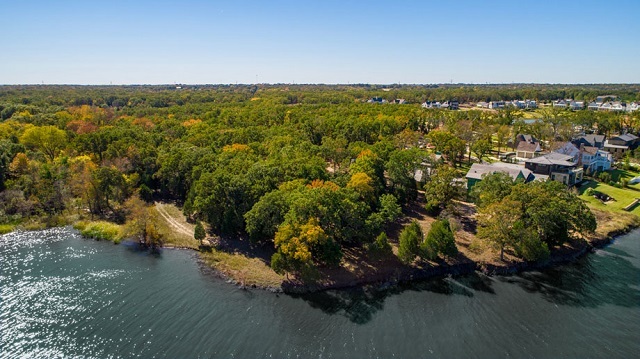 Situated on Cedar Creek Lake, this stunning vacation home community is a popular destination for Dallasites, considering it’s a getaway that’s only an hour drive south of the Metroplex. Of course, being so close to the city means that you have access to some great amenities and events, and to show their appreciation, Long Cove went all out at the annual Holiday Bash this year. See for yourself after the jump! Long Cove on Cedar Creek Lake, one of the country’s premiere waterfront communities located just an hour southeast of Dallas, recently announced plans for a new putting course, which will be the second-largest putting green of its kind in the country and the third largest in the world. Designed by renowned golf course designer David Zinkand, the putting course, which is named “Thistle Never Dhu,” was carefully designed to allow golfers of all ages and skill sets to practice while enjoying time with family and friends. The course will be completed in spring 2018. Six months has gone by fast for me writing about vacation homes for SecondShelters.com. What have we been covering? Beach, lake, ranch, and mountain abodes, among other destinations of interest to North Texans. Year end is a time to look back and reflect. What are the top spots for vacation homes for DFW residents?